Printing confidential information on a shared printer in a public place or large office can be risky, but several technologies help you eliminate most of the risk. For office or home network use, the protection comes from the printer driver. In a public place, such as a school or public library, a college computer lab, or a print shop, risk reduction depends on the steps the institution takes to promote security. Some networked printers let you send private print jobs to them. Brother, Xerox, and HP make some models that have this feature. 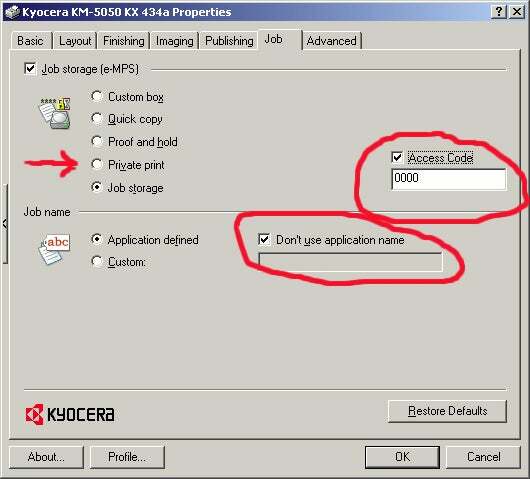 To use private printing, you may have to enter a four-digit PIN when you send the print job, and then reenter the PIN on the printer's 10-digit keypad when you reach the printer. With some machines, you must also provide the correct user name and the name of the document. As soon as it completes a private job, the printer will delete the job from its memory. The printer driver for each brand and model accomplishes this task in its own way. With most models, sending the private job is started the same way you start any print job: File, Print or Ctrl + P. Kyocera's KM-5050 KX (which we used for the illustration below) lets you check Private Print and prompts to you to enter a four-digit PIN (called an Access Code) and an option for a name. Many academic institutions and public libraries use software, made by Pharos Systems, that charges users for each print or prevents students from abusing the privilege of free printing. You can take advantage of these features to print securely. In a typical school or library, you have to enter your student ID or library card number into the printer before printing. If the system requires payment, you have to pay before your print. These steps ensure that your document will print only when you are standing in front of the printer. Ensure that no one else sees your private print jobs, whether you're at home or in a public place.